March is here which means Spring is on it’s way (let’s hope) and it is time for a new flower of the month. What better way to say goodbye to the snow, and welcome the cool breeze and sunshine, than with a bouquet of Daffodils. There is an Ancient Greek tale of a man named Narcissus who loved to look at himself. One day, as he was looking at himself in a pool of water, he fell in and drowned and from his grave a flower grew. This flower would be named the Narcissus, which is more commonly known as the Daffodil. From this tale, the Daffodil is seen as a symbol of beauty. It is also seen as a representation of wealth and good fortune in Chinese heritage and is used as the symbol for cancer research. Many are familiar with the appearance of the Daffodil. Daffodils are longer stemmed and bloom about 5 or 6 flower. Daffodils come in various colours with the most common being golden-yellow in colour, perfect for the spring. Daffodils do well with about 1 inch of water per week while they are actively growing and blooming - from March to May. Mulch helps Daffodils conserve moisture. Don’t let the snow deprive you of the beauty Daffodils can bring! 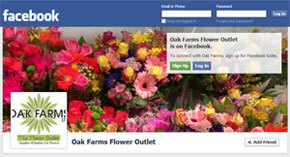 Say goodbye to old man winter and hello to spring, with a beautiful bouquet of daffodils form Oak Farms Flower Shop.